Ornament traits are decorative characteristics that are used by birds to rival other males and to attract mates. They have high heritability and are exposed to strong, environmentally sensitive selection, and so are expected to evolve rapidly in response to sustained environmental change. 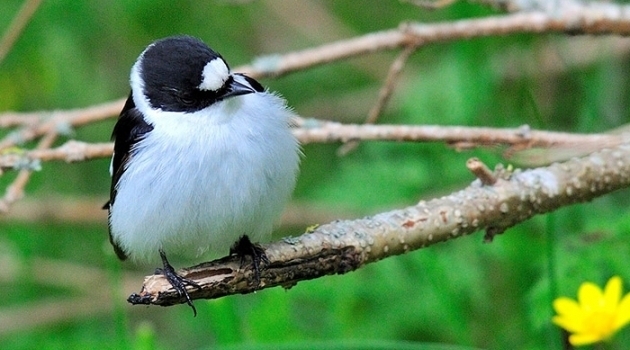 The new results, published in Nature Ecology & Evolution, are based on a long-term study of a breeding population of collared flycatchers (Ficedula albicollis) on the Baltic island of Gotland between 1980 and 2014, with 15 generations and 10,842 individuals. In collared flycatchers the white forehead patch is an established ornamental trait: males expressing a large forehead patch have a competitive advantage over rival males. During the studied period the annual fitness selection on forehead patch size switched from positive to negative, a reversal that is accounted for by rising spring temperatures at the breeding site: highly ornamented males were selectively favoured following cold breeding seasons but selected against following warm breeding seasons. “We therefore assessed selection on forehead patch size and used individual-level quantitative genetic modelling to infer the evolutionary change in ornamentation. The focus on individual-level data collection was key to allowing us to partition the observed phenotypic decline in ornament size into its genetic and environmental components. These results are thus consistent with adaptive evolution of an ornament in response to climate change,” says Lars Gustafsson, Professor at the Department of Ecology and Evolution at Uppsala University, Sweden. Trade-offs between investment in ornaments and investment in survival are well documented and often invoked to explain evolutionary stasis. Here, the researchers describe a dramatic reversal in the selection acting on a sexually selected trait, suggesting that the balance of this ornamentation–survival trade-off was fundamentally altered over the study period. The influence of spring temperature on selection must be mediated via some ecological driver. “We view this study as an opening, rather than a conclusion. The lack of a proximate mechanism linking the changing local climate to the reversed selection remains frustrating, and more work is needed to understand how the long-term genetic shift in ornamentation is being realized,” says Lars Gustafsson. Taking a step back, the new study demonstrates the value of long-term population studies to evolutionary biology. As others have highlighted, such studies offer unique insights into the nature of evolution: while examples of exceedingly rapid evolution are known (for example, the evolutionary responses of Darwin’s finches) these appear to be atypical, and most demonstrations of ‘evolution in action’ rely on data collected over several decades on thousands’ of individuals. “Indeed, Lars could not have foreseen back in the early 1980’s that his study would one day be demonstrating the impacts of climate change on evolutionary dynamics, valuable biological insights often benefit from the painstaking efforts of past long-term research,” says coauthor Dr. Simon Evans at Uppsala University and the University of Zurich.